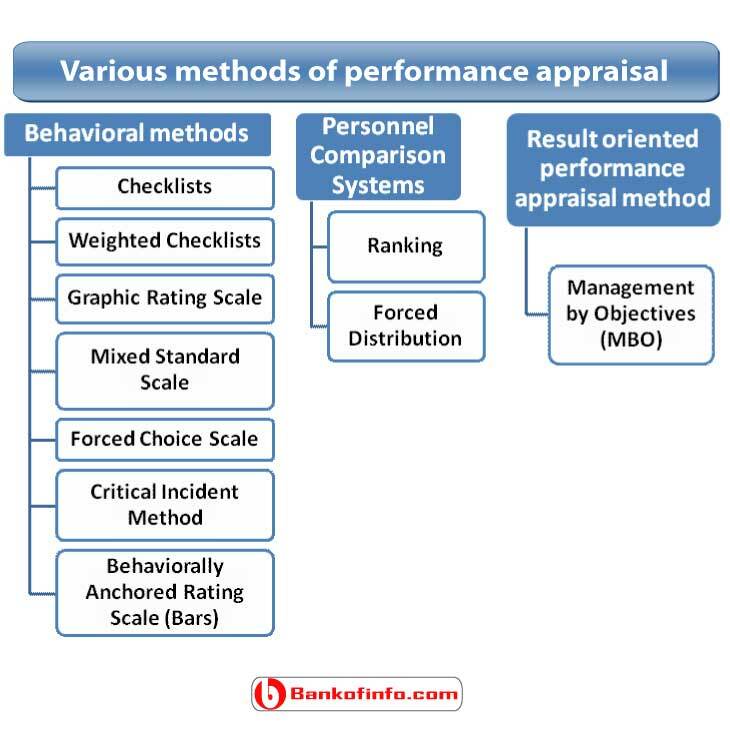 A number of different methods of performance appraisal are available. Some methods focus more on employee behavior (for example, planning or organizing); others are more results oriented and emphasize the results of employee behavior (such as the extent to which an employee reaches goals and objectives). Within the behavioral methods, employees can be evaluated based on an organizational or standard or they can be evaluated relative to others. Checklists: In its simplest form, the checklist is a list of descriptive statements and/or adjectives describing job-related behavior. If the evaluator perceives the employee as possessing a particular trait, the item is checked. If the evaluator does not perceive the employee as possessing this trait, the item is left blank. Each item listed reflects either a positive or negative quality that an employee could possess. One point is added for every positive item checked, and one point is subtracted for every negative quality checked. Weighted Checklists: The checklist described above evenly weights each item. When this type of weighting scheme is not appropriate, a weighted checklist can be used. This method uses essentially the same format as the one described above. However, after the list has been completed, a weighted value is applied to the responses. The evaluator does not know how the items are weighted. The points assigned to the weighted responses are then totaled to provide an overall rating. Graphic Rating Scale: One of the most widely used performance evaluation formats is the graphic rating scale. There are many reasons for its widespread use. First, graphic rating scales are easy to use. Evaluators can rate a large number of individuals in a short amount of time. Also, these scales are easy to understand and explain to the rates. Finally, they are simple to develop and change when needed. The ratings are made using a scale that is divided into several levels, usually 1 to 5, with adjectives such as unsatisfactory and outstanding anchored at the two extremes of the scale (i.e. 1= unsatisfactory and 5= outstanding). The evaluator reads the quality to be rated and then determines at what level, if at all, the individual demonstrates it. A graphic rating scale can be used to rate an employee’s overall performance, but usually it rates a number of characteristics such as quality of work and knowledge of the job and then the values on each of the individual characteristics are summed to create an overall rating. Mixed Standard Scale: One variation of the graphic rating scale is the mixed standard scale. Instead of rating a behavior, such as attendance, the evaluator is given three conceptually. Forced Choice Scale: The forced-choice scale was designed to increase objectivity and decrease subjectivity in ratings by camouflaging the “best” responses. With many appraisal formats, raters are able to easily locate the positive and negative items and therefore can inflate the score they provided by rating the positive items high and the negative items low. Forced -choice ratings scales make padding ratings more difficult because raters are required to select an item from a pair of items that most closely reflects the individual being rated. Critical Incident Method: A critical incident is a written description of a highly effective or highly ineffective performance. To use the critical incident method to appraise an individual’s performance, the evaluator keeps a journal of critical incidents for each individual being evaluated. Critical incidents should contain 1) the circumstances incident 2) the setting in which the incident occurred. 3) The employer did that way effective or ineffective. 4) The consequences of the Incident and 5) the extent to which the consequences were within the employee’s control. At the end of the evaluation period, these reports are used to appraise the employee performance. Although recording employee behavior can help the evaluator remember the range of behavior that occurred during the evaluation period, it is very time consuming and difficult to quantify. Behaviorally Anchored Rating Scale (Bars): BARS are sophisticated method of evaluating employee performance based o employee behavior rather than attitudes or assumptions about motivate or potential BARS is a numerical scale that is anchored by specific narrative examples of behaviors that range from very negative to vet positive descriptions of performance. Ranking: The ranking method is used to evaluate an employee on or her overall performance. To use this method, the evaluator places employees in a specified group (e.g. all subordinates reporting t( supervisor) in order from the “best “performer to the “worst” perform Innocence, the evaluator simply looks down the list of employees the rated and selects the individual he or she believes had the best ova performance for the evaluation period. This name is written at the top sheet of paper and crossed off the list of names. This process is repeated until all the names have been crossed off the list. Another ranking approach is called alternative ranking. Under this method, the rater selects the best overall performer, writes the name on a new sheet of paper, and then crosses the name off the list of rates. Next, the appraiser selects the overall worst performer, crosses off that name, and transfers it to the new list. He or she then selects the best performer from those left on the list, This alternating process contrives until all employees have been ranked. The following two performance appraisal formats are results oriented. Thus, the evaluators are rating the outcomes of the employee’s behavior rather than the actual Behavior itself. Management by Objectives (MBO): A frequently used performance appraisal method is management by objectives. Management by objectives (MBO) has been around for over 30 years and is usually credited to Peter Drucker. Drucker was trying to design a systematic approach to setting objectives and performing appraisals by using results that would lead to improved organizational productive.